Now that you have Highfive up and running, it's time to learn the basics and understand what Highfive is capable of especially in various business scenarios. Before deep diving into all the awesome features, here are a few high level things you need to know about how it all works! Highfive is a way for you to meet face-to-face with your team, whether it's through our conference room device, computer, or mobile device. 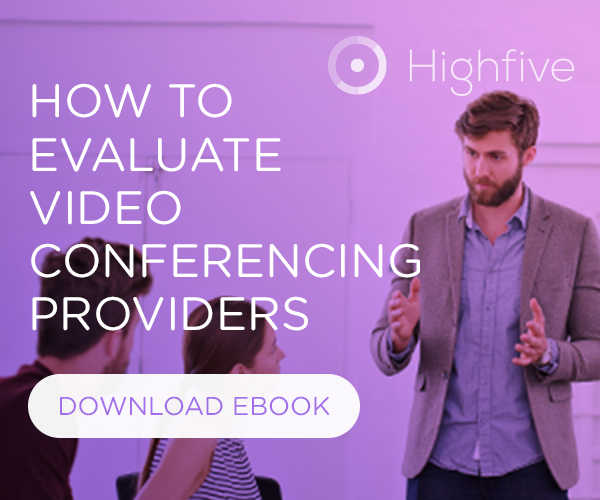 The Highfive concept is simple - Highfive enables you and your team to bring video everywhere. It's kind of like bringing the conference room with you no matter where you are. There are no meeting hosts and no confusing control panels; just an easy-to-use, always accessible platform for meeting with your teams face-to-face. Highfive and your devices interact seamlessly - Think of using Highfive like turning on a portal into a conference room. To turn that portal on, you need to start it up by using a laptop or mobile device, then have someone join using their own Highfive camera, laptop or mobile device. Once you've accessed a Highfive device, your computer or mobile device become a "remote control" for the camera and the meeting. You can share your screen, mute yourself and other participants (and so can anyone else in the call), turn the video camera off as well as other useful options. Highfive call URLs and scheduling are easy - The Highfive URL is like a virtual conference room: everyone meets up in the conference room. Every conference room has a name, just like a Highfive call URL. You create the call URL by simply starting a call with a unique name. Once you've started a call, you've automatically generated a URL in the following format: [yourcompanydomain.highfive.com/<youruniquename>]. You can also easily transform a Google Calendar event into a Highfive call by simply installing the Highfive Google Calendar extension and clicking "Add a Highfive call" button. Highfive can be used internally or externally - When you start a Highfive call at your company, anyone else in your company who you'd like to participate can join seamlessly, just like they would walk through a door into a conference room. When you want someone from outside your company to join your meeting, they join as "guests." Just like you'd have to head to the front of the office and meet your guest in the lobby and give them a guest badge, a Highfive guest from an outside company will have to be "let in" to the call. The guest simply creates a virtual "guest badge" while they wait in a virtual "waiting room" until someone from the company has let them into the call.